If, like me, you have access to unlimited supplies of apple during the autumn, your thoughts naturally turn to making cider and apple wine. To do this you need to extract the juice from the apples. Most cider makers do this in a two phase process. First, the apples must be crushed or ground by a machine (known as an apple scratter) and then the pulp must be run into the press, and the juice extracted. The purpose of the apple scratter is to grind up the apples, and smash up the cell structure to help extract the juice - you are not trying to make baby food - the required consistency is more like grated apple, rather than something you've put through the blender. Apples are quite hard and require a lot of force, so some kind of mechanical device is called for. 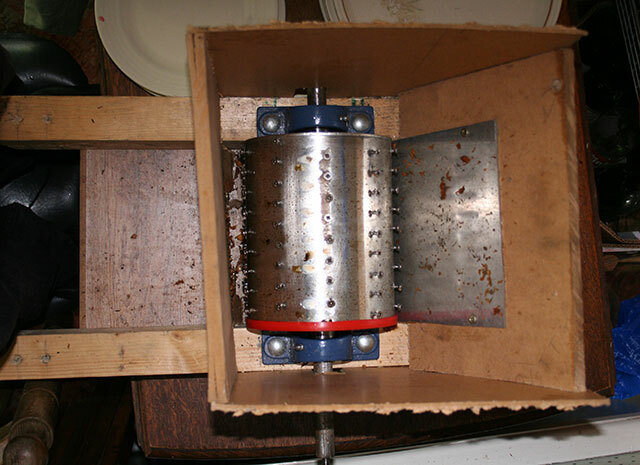 Commercially available crushers are usually very expensive, for example, so naturally we want to make our own apple crusher for home cider and apple wine making. Most of the designs I have seen involve a drum, usually of wood, with screws in it, mounted in a hopper. The drum is driven from a motor, and the apples are drawn in by the screws and smashed against the sides of the hopper and ground up by the screws. I found that getting hold of a suitable bit of wood was very difficult. Most supplier wanted a stupid amount of money for a suitable lump of wood. I don't like wood - it soaks up water, it splits and I like metalwork :). 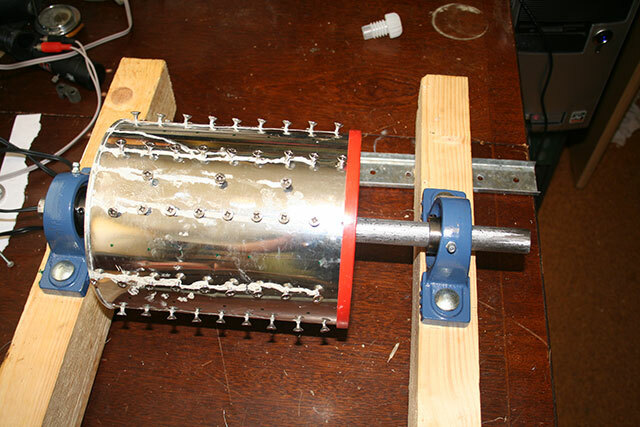 First I decided that a roller for my apple crusher could be made using a bit of drainpipe filled with concrete. Whilst pondering this idea, I was gazing around my workshop and saw a nice neat row of stainless steel coffee tins lining the top shelf, full of nails and screws etc. This metal cans are about 10 inches high and 6 inches in diameter. I decided this was perfect. I drilled the sides with small holes - about 120 holes. I cut a round hole of 20mm in the top and bottom of the drum to take the axle, which was a 20mm by 18 inches steel bar I pinched from a skip outside a local engineering company. Ebay provided a couple of pillow bearing blocks. The tin was filled with concrete around the axle, and the 120 stainless steel screws screwed into the concrete. Once set, the whole thing was rock hard and the screws very firm. All you need to do is attach a wooden box to funnel the apples, attach an electric drill to the crusher axle and off you go!